The A440 is the quietest high-performance ribbon microphone ever produced. It combines all of the warmth and beauty of the classic 44 with a signal so hot, you’ll have to experience it to believe it. The A440 is the quietest high-performance ribbon microphone ever produced. It combines all of the warmth and beauty of the classic 44 with a signal so hot, you’ll have to experience it to believe it. As with the rest of AEA's Big Ribbon™ microphones, it needs very little EQ, takes it nicely when you want it, and is free of resonances in the audible range. 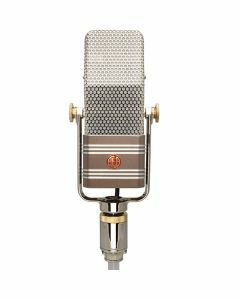 The A440 is unlike any other microphone on the market today, and no professional studio should be without one. Because of its exceptionally low noise floor and its classic sound characteristics, the A440 has quickly become a favorite of even the most critical ears. Orchestral sampling experts EastWest Studios now favor their pair of A440s over their vintage RCA 44s due to the advantages in noise performance. Musicians with very high sound-quality demands and the desire for a long-lasting investment for their microphone locker gravitate towards the A440. Legendary guitarists Peter Frampton & Neil Young, or Irish alternative rockers The Script, all share their love for this stunning microphone.